We all have a room that’s been waiting much too long for a makeover. Church & Sons Painting promises to bring fresh new ideas along with our paint brushes to brighten and cheer up even your darkest of rooms. 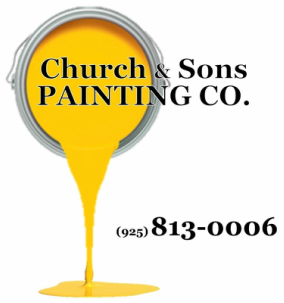 If you’re looking for a painter who will give your paint project the tender loving care you would give but don’t have the time or patience… call Church & Sons Painting today! Send us your contact information and we can immediately start discussing what Church & Sons can do to make your paint project look amazing! Take a look at the photos below for Before and After pictures and the other "little things" Church & Sons Painting will do to ensure every inch of your new space receives the quality paint job you're looking for. Check out the photos of this adorable rancher I painted in sunny Modesto! I took this outdated 60's mint color and changed it dramatically. We used Brushed Lavender, Native Lilac and Bistro White to beautifully transform this bathroom and master bedroom. The customer loved it and was extremely pleased. Result: A happy customer! We used Brushed Lavender, Native Lilac and Bistro White to beautifully transform this bathroom and master bedroom. Church & Sons Painting Co. will make your deck look brand new!!! A customer's master bedroom with it's original generic suburban white paint job. The customer wanted color but was unsure of what direction to go. Church & Sons suggested accenting the walls with Spring Waterfall and Polar White. We had also previously proposed and added Chestnut Beach to make the 8x8 beam POP! Result: A happy customer! This home was painted for resale. The home was built in 1996 and had the original paint job. It was worn and aged. It needed a fresh coat of paint to make it sparkle and bring it back to life to potential buyers. Church & Sons Painting Co.﻿ was just the company to do it! As usual Church & Sons Painting Co. promises a satin smooth blemish free finish with razor sharp edging! A fresh coat of paint and this home is ready for sale! The home was painted exactly as the customer wanted! Before: As shown in the image on the left this customer was accustomed to color but wanted a change. The customer wanted to brighten and warm up the wall and asked if we could "do something with the fireplace." After: Church & Sons changed the whole tone of the space with an eye pleasing Honey Tea. These pictures also show we pull down all blinds and clean window sills before priming. This is a necessary element to ensure a strong adherence of your selected color. The customer also allowed Church & Sons free reign with enhancing the appearance of the fireplace itself. Result: A happy customer! A customer's living room area had an incomplete look. The green accent wall also had a yellowish tone which was unappealing for this area and did nothing to match the flooring. The customer and Church & Sons enjoyed working together to plan every detail of enhancing this space. Both sides of the fireplace were accented by Avocado Green. The new color also matches the flooring and fireplace perfectly. Result: A happy customer! The customer asked if I could update their guest bathroom completely. Of course.. that's what I do!! I don’t just paint. I design! So with the customer’s permission I installed brand new towel racks where none existed before. I removed the old rusted out medicine cabinet and replaced it with a brand new wood cabinet. I painted the new cabinet to accent the bathroom because I wanted it to match. I even changed the light switch & outlet covers and the light bulbs. I also purchased and installed the shower curtain to match. Oh and of course I painted leaving a satin smooth finish and razor sharp edges. Needless to say the customer was ecstatic! What did I get from it? A happy customer and that’s what’s most important! Our customer had rooms to rent and wanted a look that would reflect that. ​Church & Sons recommended adding color to the hallway to bring out the trim in the molding. White looks clean but in some areas can have a sterile hospital like appearance. Church & Sons Painting suggested Woodrow Wilson Maize for the walls complimented by Chestnut Beach giving the trim a rich wooden appeal. Result: A happy customer!